Fall is here and that means one thing at our house. Football season! I couldn’t deny all of you ladies the recipe that seems to be our game day essential. I never liked sloppy joes when I was little and I think it had to do with the fact that it usually came from a can. This homemade, super easy and DELICIOUS recipe will have you wondering how the stuff in the can ever made it into your mouth ;). This is a great party food as well, throw it in a crock pot, bring some buns and people will be begging you for your secret! This is a meal that the whole family is bound to love! The recipe calls for 1/2 a cup of celery, but in my opinion the celery is one of the best parts. 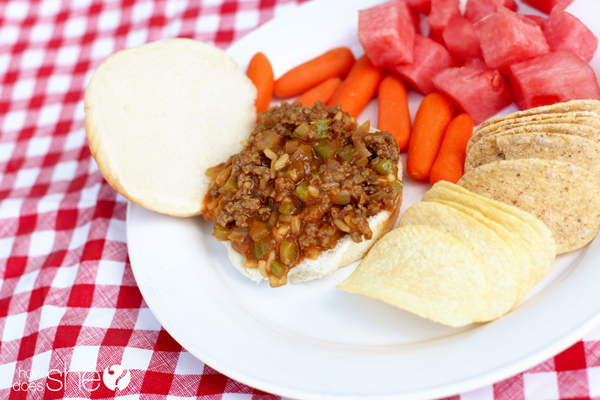 It gives it that crunch and freshness that most sloppy joes lack. I usually end up adding a full cup of celery to this recipe. If you’re not a big fan of red meat, feel free to swap that hamburger for some turkey burger! I make my sloppy joes with turkey burger half the time, and truth be told.. I kind of prefer it! Brown everything together till the meat is cooked and the onions begin turning clear. If you feel like the mixture could use a little more sauce just add a squirt more of ketchup and a dab of mustard! Oh, and did I mention.. this stuff makes THE BEST leftovers. Scoop some from your Tupperware, reheat and eat it throughout the week. You might be fighting over who gets the last bits. In a large pan combine hamburger, onion and celery. Cook on medium high heat until the hamburger is browned. Drain grease from the pan. Add chicken gumbo soup, ketchup, mustard and a dash of chili powder (if desired). Reduce heat and simmer until ingredients are warmed through. Serve on hamburger buns. Chips, fruit and veggies make the perfect sides! What is one of your favorite game day foods? I see rice in the pictures but not in the recipe. Mmmm……….that looks yummy! I’m going to try it! This is the same recipe I grew up on! It brings back great memories when my Grandmother would fix this for us and now I make it for my son! This is the only sloppy joe recipe I will use! I’m so glad to see it here 🙂 Now I know what to fix for supper tonight! Thanks so much! Just made this for lunch and it’s DELISH!!! I had to walk out of the kitchen before I ate it all!!! LOL Thanks for sharing, I will defiantly be making this on a regular basis! !